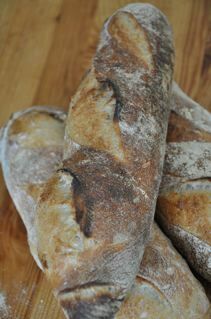 Anyone who knows me from back when, knows that one of my goals as a home baker in France was to make a great baguette. I went through a series of trials and found that the technique used by Anis Bouabsa gave great results. French bakery baguettes, much like the photos you can see in Calvel's book, are pretty much basic French baguettes and in my opnion, not that fabulous. The BEST baguette in France is either called baguette "Tradition" or a house name, such as Baguette "Catalane". The baguettes respect strict rules about their production, made only with high quality T65 without additives (unauthorized ones) and at least part of the process must be hand done (usually the shaping and oven loading). They often have sourdough in it but spiked with yeast and if there is no sourdough, the dough has probably gone through a longer fermentation period to help develop flavour and a better crumb. Not all bakeries offer this type of baguette because it is more expensive to produce and therefore more expensive to buy, usually turning around 1,05€ vs ,75€ for a regular one or even less in a supermarket. In some areas, French people don't want to spend the money and so the baker just doesn't bother with them. In general they have a more rustic appearance, either pointy ends or sometimes squared off ends, not always slashed as a usual baguette but something more creative. These are the only baguettes I find edible in France. Now, about flour. There has been a LOT of discussion in this forum regarding French flour and the famous T55. How to get the same result in the States. Well, first of all, there are two types of flour in France... regular people flour and baker's flour. I have always used organic, stone ground flour. 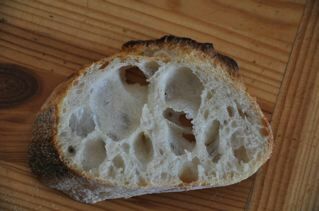 This provides inscredible taste but it is hard to get light, great oven springed bread. My baguettes are always on the squashed side even if the crumb is open. I prefer to eat mostly organic foods and so I didn't really look in to other options. But as an avid home baker, I have "professional" curiosity and so I went about testing baker's flour. Now, you have to know that baker's flour is another ball game. There are a number of different millers to choose from and each bakery has the choice of either being fully independant or affiliated with a flour company (like Baguépi, Banette, etc) The bakery get's advantages when they have a contract wiht one of these companies through free training, loans for starting up a bakery, free packaging, etc. I have had the opportunity to bake with these flours and some are good and others not. I have made a decent baguette with Baguépi but I injected it with sourdough and put it through a cold retarding. These baker's flours have some common ingredients: Wheat flour, malted wheat flour, sometimes malted barley flour, gluten, fungal amylases, ascorbic acid. I have seen a T65 baguette flour with additions of corn flour to make the flour more cream colored!!!! So, I have been playing around with this flour...but a special type called T55 gruau which gives the qualities of a whiter flour but has much more gluten in it... probably around 11-11,5% (I have to check but don't have the bag because I bought it from a baker). This isn't a flour you can buy at the store and it is hard to find on the internet. Bakers have easier access and much better prices on raw materials. I payed ,74€/kilo! Not bad for a specialty flour! I bake my baguettes dark on purpose, I think the crust has better taste and crunch. Baguette tradition has a slightly thicker crust and a crumb with more chew to it. I don't like cottony baguettes. Anyway, I hope that maybe we can clear up some stuff about what that famous French T55 or 65 is all about. I do think you can make great baguettes in the States without having to have our flours over here. A very good quality flour that is around 11% protein (maybe with some added malt) should do the trick, which I assume is the case since there are some bakeries making great baguettes over there. The way they are baked counts, too. They need to be on a hot stone or four à sol. The ones baked on racks just aren't as good. I had to type this out fast, it's Wednesday over here... kid day. So excuse the style. Just wanted to share with you! Thank you for the post - I was inspired to immediately try this technique with the recipe you described using KA Bread flour and a DLX. I will let you know how it turns out - I am in the middle of the 20 min autolyse. How did they come out??? It's always a flour situation. That's the whole problem! Our flours are so different. But this flour is higher in gluten than our regular T55 and so acts much more like American flours. I have been able to follow recipes that I haven't before (like Bagels). When mixing the gluten has to be very developed. The dough gets to be very airy and wobbly but still holds together. It's an extremely slack dough, though. But when the baguettes proof, they are like puff clouds. I think I'll take photos of the process. I also want to try by hand. I made them again yesterday and wrote down the exact formula. So, when I get time, I post on my blog, Au levain. I like dark baguettes also. Beautiful! And the comments on the flour are also appreciated! I've got the stone and access to good flour, but I never thought of adding malt to the flour, Jane. Thanks for that tip - will certainly give it a try. Your baguettes are beautiful (as usual)! we need more of your kind of reality. too much baguette fixation here! I've been trying to working on GMP french flour T65, but have yet to figure out the hydration we should implement, we uses chad robertson and ken forkish recipe, but tweak on the hydration, cause the dough from french flour will be too sloppy if we go more than 65% hydration, and we only do the stretch and fold method. Could you pls give some advice for high hydration bread using french flour? 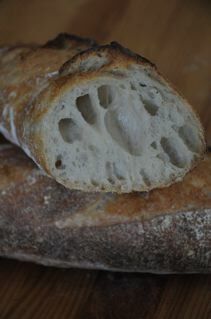 Would like to get some advice from you about hydration when using french flour T65. I use GMP T65 for making most bread, but had problems with shaping cause it's hard to handle especially when it's 65% hydration, only manage to handle the dough properly at 60% hydration. How much hydration do u normally go? And any other advice on using french flour for bread making? Any updates on this thread? I've just started out using Ken Forkish's recipes and having a tough time with hydration. I live in France so have access to T45, T55, T65, etc.. I've been experimenting with T65 from a local supplier but find the final dough very difficult to shape...it's more reminiscent of that film The Blob than bread dough.